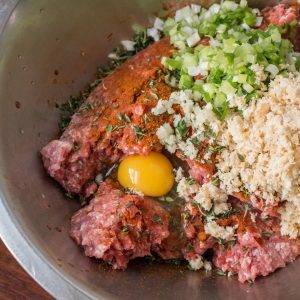 Rich lamb meatloaf, with a touch of spices and Shepherd Song’s own goat bacon is a comfort food crowd-pleaser. 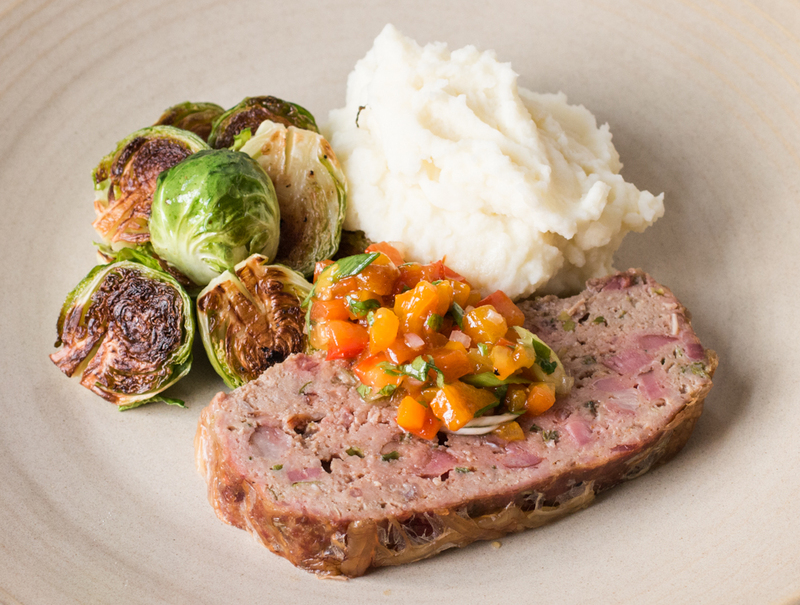 Meatloaf is a classic everyone loves, and a great way to show off our grass-fed lamb and goat. This isn’t your ordinary loaf though, Chef Bergo shares some trick that ensure a juicy, result: caul fat, and milk-soaked breadcrumbs. 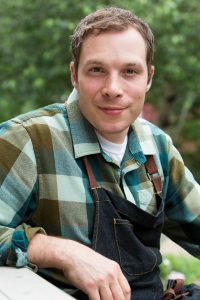 Caul fat is an inner lining of fat from the animal, that is very thin, and useful for wrapping meat, especially lean items before cooking. 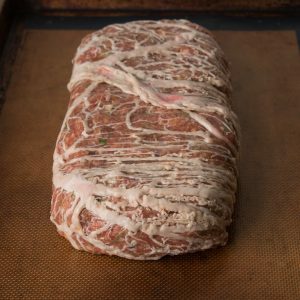 Traditionally pates, terrines, and meatballs are enclosed in the lacy fat, so wrapping a meatloaf in it is only natural. The caul is optinoal though, and you might use bacon, or just spread the meatloaf with a red sauce-at the bottom of the post is an example using a ketchup made from roasted red peppers and tomato puree. 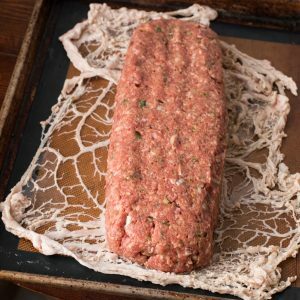 The other special ingredient that makes our grass-fed lamb meatloaf taste special is our Tavia brand spice, available only through Shepherd Song Farm. Tavia has a rich, slightly spicy East African flavor, and is similar to traditinoal berbere spice. 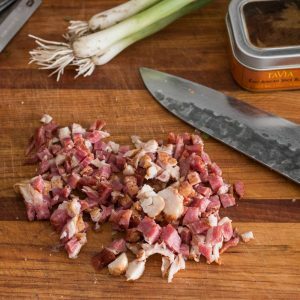 We sell Tavia, but it would be fine to add a blend of seasonings you like instead. 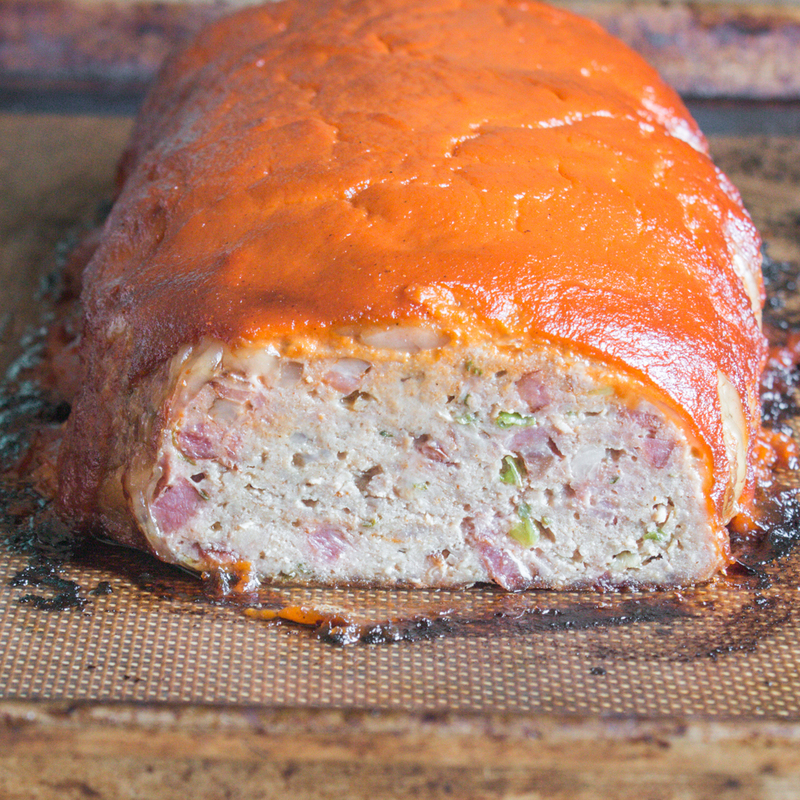 Using the Tavia yields a slightly spicy meatloaf. 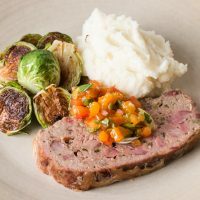 For a fine comfort food-inspired meal, Chef Bergo suggests pairing the meatloaf with sauteed green vegetables, mashed potatoes, and a relish made from roasted bell peppers. Preheat the oven to 350. Combine the breadcrumbs and the milk and allow to soak for 15 minutes, then squeeze the breadcrumbs to allow excess milk to drain out. In a large bowl, combine all of the ingredients except the caul fat and mix well. 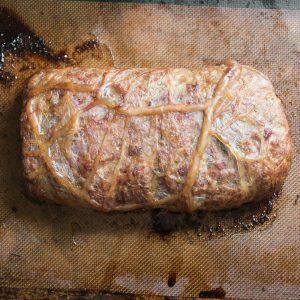 Cook a small piece of the meatloaf to check the seasoning, adjust as needed, then wrap in the caul fat and place on a baking sheet lined with parchment for easy cleanup. 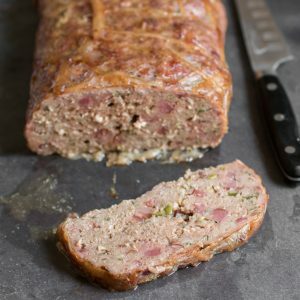 Bake the meatloaf for 45-60 minutes or until just done, (155F). Remove the meatloaf to cool for 10 minutes before slicing. To serve, cut 1 inch slices of the meat loaf. Serve with mashed pototoes, and pass the room temperature relish at the table. The meatloaf is great reheated gently browned in a pan for sandwiches, etc. Char the peppers over a burner all over or in a hot oven, then transfer to a plastic container and allow to cool/steam. Peel the peppers, then remove any seeds and remaining pith. Dice the peppers ½ inch and combine in a bowl with the remaining ingredients. The relish will keep for 1 week under refrigeration. Make sure to wrap the caul tight. Additional Idea: Cover the Meatloaf with a Red Sauce Before Baking.